It’s a mistake to think that you alone as the speaker decide what you get to say and how you’re going to say it. Communication only happens when there are a speaker and an audience. You have to consider them first, even before your message. 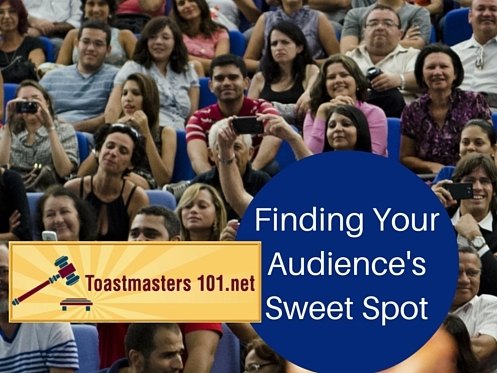 The audience will set the parameters of the words you choose and the techniques you use to convey your message. The audience is why you’re speaking. You’re there to serve the audience, not your message. I think that’s where speakers often go awry in their passion to convert or to persuade. When we forget that our message is nothing when people aren’t the primary consideration in our presentations. The best example of this is Dr. Martin Luther King Jr’s most excellent speech known as I Have a Dream, given at the Lincoln Memorial during the March on Washington during the Civil Rights Movement of the 1960s. King’s focus is on humans and serving them with his message. That’s why this speech is recognized as the best speech of the 20th century in the United States. Was his speech above the audience? No. Was it challenging his audience? Yes. That’s the exact spot a speaker needs to aim for when crafting a speech. Civil discourse is becoming anything but anymore. Political discussion seems to be following the way of comedians with the increased use of four letter words. Should we be using these words in our speeches? It’s a risky gambit. The key isn’t should or shouldn’t we use these words, but how will our audience respond? Communication isn’t a one-way flow of words – it requires both a speaker and a listener. Without an audience, there is no communication. If the audience shuts down because of our word choices, be it profane, vulgar, or jargon, we stop the flow of communication and end our effectiveness as speakers. This is the point where we often see new Toastmasters start to struggle. They can’t think of another speech topic. The problem isn’t they can’t think of another topic, it’s that they’ve talked themselves out of all of the others they’ve thought of. We’re here to learn to speak and to listen. Talk about anything that you’re passionate about and we’ll listen. Don’t toss your ideas – develop them. Find a way to present that idea with a good introduction, an informative body and a strong conclusion – and we’ll be delighted to listen. Passion will make even a topic I’m not interested in more intriguing and compelling. You may even find a way to make golf interesting to me! We’ll never know until you try. Talk to your mentor about your ideas. They can help you find ways to make your topic work. Don’t give up now. It’s all too easy to quit right now. You’ve barely begun to learn how to improve your speaking. Are you getting discouraged because you’re very aware of what you’re doing wrong? Now it’s time to start practicing what to do better. One of the best ways to improve your speaking is to be a speech evaluator in a club meeting. Nothing will help you focus better on speaking skills than to have to intently listen to someone else’s speech and give them points of growth. I’ve discovered that the points of growth I see are most frequently the points of growth that I need to apply to my own speaking. Funny how that works! Sign up on your club agenda as a speech evaluator and be sure to give your Competent Leadership manual to someone for them to evaluate you and give you credit for filling the role. How about evaluating us on iTunes?